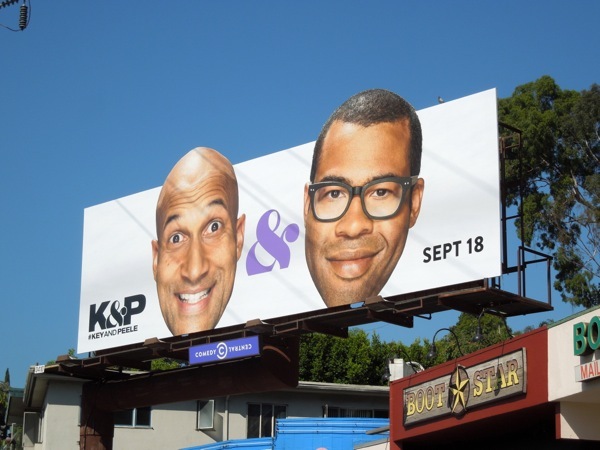 It's no wonder that Keegan-Michael Key and Jordan Peele are all smiles in this special extension billboard, as the funny duo are back for a third season of silly sketches on Comedy Central. Expect more fun skits from the comedians like Substitute Teacher, Pizza Order, the Liam Neesons-loving Valets and even 'President Obama' and his anger translator 'Luther'. 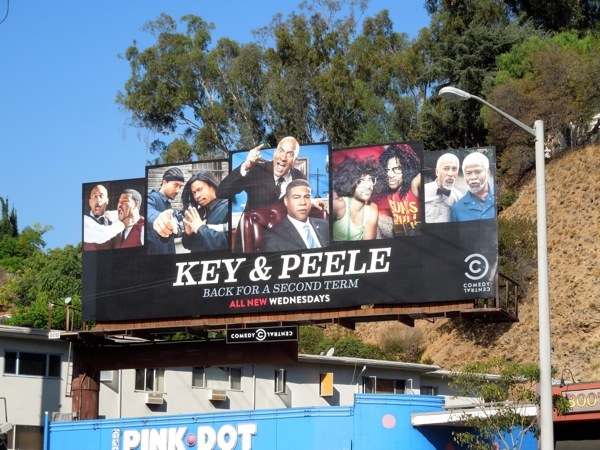 As a special bonus here's the season two 'Back for a second term' billboard from last year showcasing a few of Key & Peele's characters and certainly capitalising on the U.S. Presidential election race, which was spied along L.A.'s Sunset Strip at the top of La Cienega Boulevard on October 2, 2012. Meanwhile this new eye-catching season three special extension with their cut-out head shots was spotted in the same location along Sunset Boulevard on September 12, 2013. If you like these ads and are a fan of Comedy Central, be sure to also check out this recent four day changing billboard for James Franco's Roast, the Workaholics season three Fully Torqued special installation billboard and Nick Kroll's hilarious canine plastic surgery parody billboard. 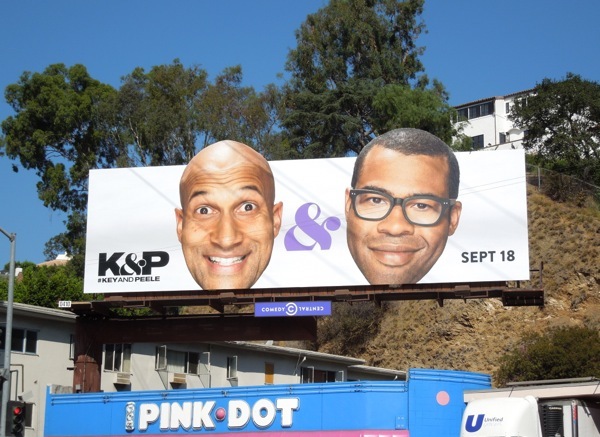 Keep laughing and stay tuned tomorrow for even more new season TV billboards filling the skies of L.A. at the moment. 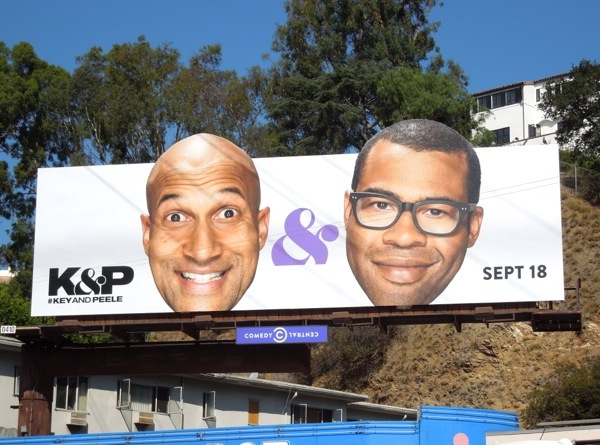 UPDATED: For their 2014 Emmy Consideration billboard comedians Key & Peele decided to poke fun at Donald Sterling following his racist remarks controversy, that forced him to sell his stake in the Los Angeles Clippers basketball team, with this timely ad creative. 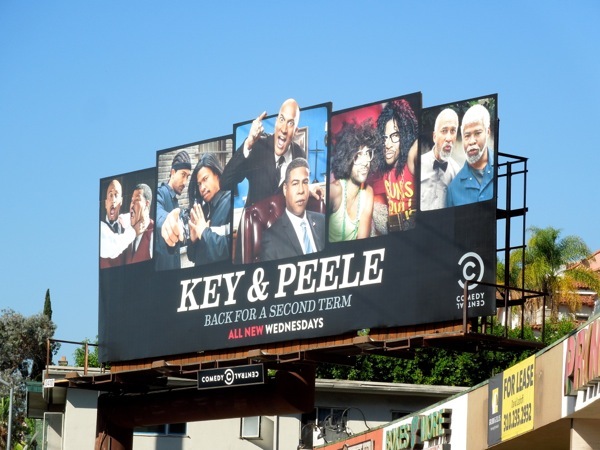 This hilarious and provocative 'Vote for us or Donald Sterling wins' billboard was snapped along the Sunset Strip in Comedy Central's regular outdoor ad site on May 19, 2014.